Welcome to another edition of Penguin of The Week! We are doing a triple this week to make up for missing out the previous weeks due to a busy school schedule. 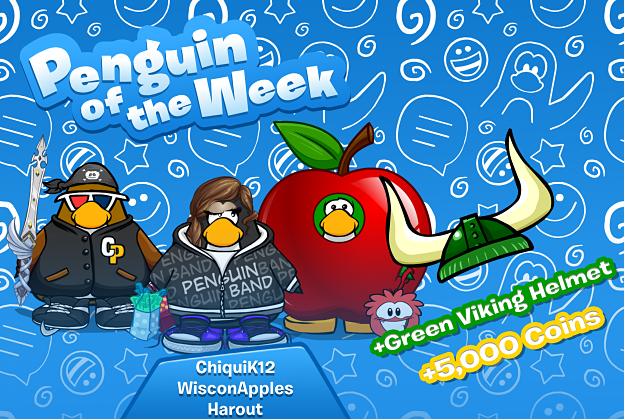 Congratulations to Harout, Wisconsin Apples and Chiquik12 for winning Penguin of The Week! Wisconsin Apples is a very active member both online and on our Discord. They help out with reports and welcome new members into our community. You can find them waddling around, wearing an apple costume. Harout is a very active member both online and on our Discord. He send in reports and is welcoming to new members. You can often see the pictures he takes with our mods shared in our Discord. Chiquik12, also known as Andrea, provides a great help to the Spanish community, has fun and teaches others in discord, participates and helps in any event with her characteristic humor. It's finally September, and it's fair to say that summer is over. A lot happened this summer on Club Penguin Online, a lot of memories were made thanks to our amazing community. We kicked off the summer with releasing the fire dojo, which was popular with everyone. Then we released the Adventure Party after celebrating reaching 700,000 registered users. Next we had our own prom, which was a huge success - the prom will definitely be remembered by the community and our staff. We then celebrated 800,000 registered users and 30,000 Discord users at the end of July. We began August with celebrating 900,000 registered users and opening a voting booth so users can vote for the next colour to add in-game. The Water Party was then released, as we were all counting down to 1 Million and then... we reached 1 Million users! We threw a customised party for this achievement, a great way to end the summer fun. We hope you've all enjoyed summer here on Club Penguin Online. However, now that school has begun that doesn't mean the team won't be working anymore. We're still dedicated in making your experience here on Club Penguin Online a great one. We're still working on the Card Jitsu elements, as well as working on the upcoming party for September. This Saturday we will begin have our first September #ModMeetup. We'll be hiring new trial moderators as well, so make sure to be here if you wish to become a trial moderator. Welcome to another edition of Penguin of The Week! We will be doing two penguins as we were unable to do last weeks. The first user to receive this reward is Wrestlingwwe. Wrestlingwwe is an active player. You can find him in on Discord, in-game, and working on the wiki as an Admin. He does a lot for the wiki community, and he finds the time to help out other people. He's a moderator on the ETA Discord as well. 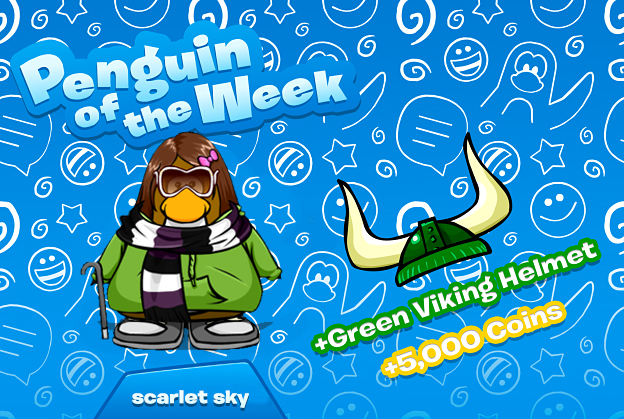 The second penguin to receive this reward is Scarlet Sky. Scarlet Sky is an active user both on Discord and in-game. She helps out other users, and is very friendly. She shares her baking creations with us in our Discord, and she continues to help the staff out with her reporting. This Friday night we'll be releasing our 1 Million Users party! We're very hyped about this as we're currently at 995,000 registered users. We predict to reach 1 Million by Thursday night. The one millionth user will be receiving 1 million free coins! We're also releasing exclusive items for the party, as well as all of the mascots visiting during the party, including new custom ones! Thank you to everyone for playing and spreading the word of Club Penguin Online! A lot will be happening this Saturday. As well as the highly talked about KSI vs. Logan Paul fight, Club Penguin Online will be extremely busy considering the release of the 1 Million Users Party, the 1 Million code, old mascots revisiting and custom mascots, and now this #ModMeetup. We'll be making this meet up extra special, so make sure you're there! Welcome to another edition of Penguin of The Week! We will be doing two penguins as we were unable to do last weeks as well. The first user to receive this award is IndiaInia7. 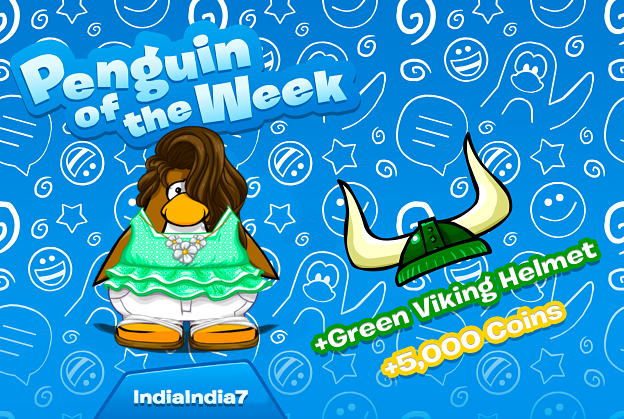 India is an extremely active user for Club Penguin Online: she is active on our Discord server, in-game and is even part of our wiki team. She is extremely friendly and is a great member of our community, congratulations India! 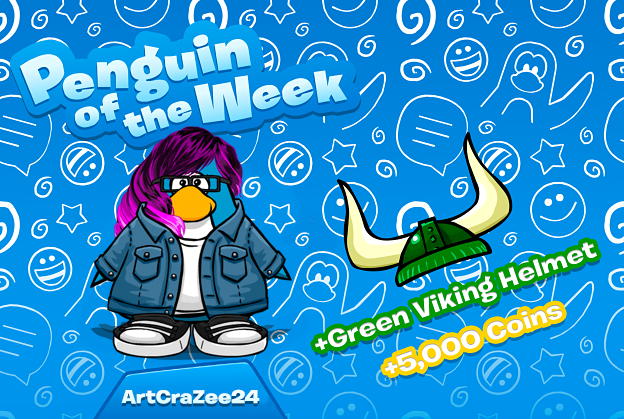 The second penguin to receive this award is ArtCraZee24, also known as 'Grace' on our Discord server. Similar to India's reasons, Grace is an extremely active member of our community and is friendly to everyone she meets. Congratulations, Grace! That's right, Turquoise is the new color being added to next month's catalog. Turquoise won by over 9000 votes, having 5000 more votes than Neon Green. Are you excited to see Turquoise in the next catalog? A few days ago we surpassed 900,000 registered users on this game. Club Penguin Online was only released to the public 8 months ago, and we're so close to reaching 1 million registered users (It took CPR 10 months to reach 1 million). Two months ago in June we were celebrating out 6th month anniversary and reaching 500,000 registered users. In two months we have seen a staggering 400,000 new penguins joining our growing community, which is absolutely amazing. We are expecting to reach the ultimate goal this month, and we have an AMAZING party ready to celebrate 1 million. In this upcoming #ModMeetup we would like to hear what you guys would like us to do in the party. The administration is very excited for this month, as we have a custom party ready to release as soon as the 1 million party is over. 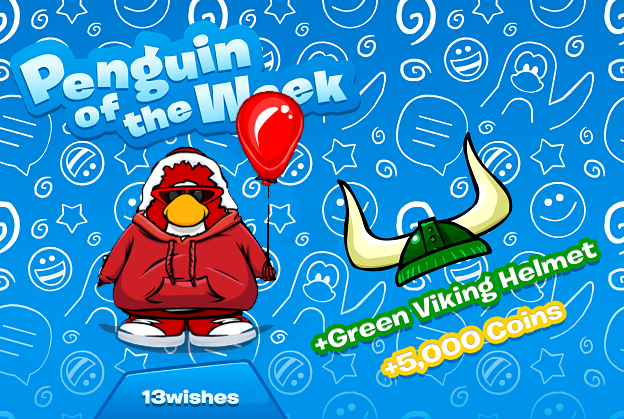 We also plan to release a new Card Jitsu Element this month, as well as a new penguin colour. We hope you guys are excited for the upcoming changes ready to happen on Club Penguin Online! As we enter August, the Club Penguin Online team's goal is still the same: to make this summer eventful and fun for all our users. We have a lot of ideas planned out for this month, including exclusive and custom items, the Army League, custom mascots, a custom party, and more! We're also expected to reach 1 million users this month, so expect something amazing in a week or two! Make sure to attend this #ModMeetup to have the chance to talk to the moderators and admins and win coins and items of your choice. We may be picking new moderators as well, so if you have applied make sure you don't miss this one. It'll also be benefitical for you to be on the official #ModMeetup Discord server (https://discord.gg/hb5nqn2). We are now at the final stage of the Army League's first tournament. A huge congratulations to the RPF and ETA army for making it this far in the tournament. We would also like to thank the other armies for participating in the tournament as well. This weekend we will be crowning the winner of the Legends Cup 2018. We will also find out who finishes in third and fourth place as the Elite Guardians and Dancing Shark Squad will both be fighting for third place. Note: All battles will take place on Sleet. Please be on the official CPO Army League Discord for more information on this tournament. Welcome to another edition of Penguin of The Week. This week the user 13wishes will be receiving this award. 13wishes is an active member of the Club Penguin Online community, and if you are on our Discord server you will know her by the name of 'Eternal', as she is very active on our Discord server as well and makes cute edits of administrators like Riley and Cindy, congratulations!